A suicide bomber rammed his explosives-laden fuel truck into a security checkpoint south of Baghdad on Sunday, killing at least 47 people and wounding dozens, officials said. 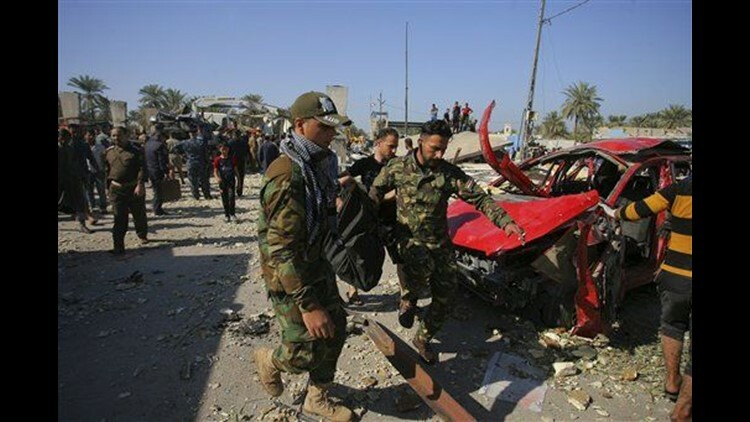 HILLAH, Iraq (AP) — A suicide bomber rammed his explosives-laden fuel truck into a security checkpoint south of Baghdad on Sunday, killing at least 47 people and wounding dozens, officials said. The Islamic State group claimed responsibility for the suicide bombing in an online statement circulated by supporters. It was the third massive bombing in and around Baghdad in a little over a week, and appeared to be part of a campaign by IS to stage attacks deep behind front lines in order to wreak havoc and force the government to overextend its forces. Crowds gathered at the scene, picking through rubble and twisted car parts in search of survivors. Smoke rose from smoldering cars that had been lined up at the main checkpoint at the northern entrance to the city of Hillah, located about 95 kilometers (60 miles) south of Baghdad. "The blast has completely destroyed the checkpoint and its buildings," Falah al-Khafaji, a senior security official in Hillah, said as he stood at the edge of the blast site. "More than 100 cars have been damaged." IS has carried out scores of suicide bombings against security forces and the country's Shiite majority. Hillah is in the country's mainly Shiite south, far from the front lines of the war against IS. Among the dead were 39 civilians, while the rest were members of the security forces. The attacker struck shortly after noon when the checkpoint was crowded with dozens of cars, a police officer said. He added that up to 65 other people were wounded. Iraq has seen a spike in violence in the past month, with suicide attacks claimed by IS killing more than 170 people. The attacks follow a string of advances by Iraqi forces backed by U.S.-led airstrikes, including in the western city of Ramadi, which was declared fully "liberated" by Iraqi and U.S.-led coalition officials last month. Such attacks "force the government and the militias to look back and reallocate resources and reassess," said Bill Roggio, a senior fellow at the Foundation for Defense of Democracies, referring to the mainly Shiite militias fighting alongside government forces. IS still controls large swaths of Iraq and neighboring Syria and has declared an Islamic "caliphate" on the territory it holds. The extremist group controls Iraq's second largest city, Mosul, as well as the city of Fallujah, 40 miles (65 kilometers) west of Baghdad. At least 670 Iraqis were killed last month due to ongoing violence, of whom about two-thirds were civilians, according to U.N. figures. Salaheddin reported from Baghdad. Associated Press writers Mohammed Kaftan, Murtada Faraj and Susannah George in Baghdad and Maamoun Youssef in Cairo contributed to this report.